The Backside Learning Center is a non-profit organization that provides educational and youth programs to the families and workers at Churchill Downs. This innovative and visionary center was opened in 2004 when advocate members of the Kentucky Derby Museum and Churchill Downs, saw an immediate need for educational resources for backside workers and their families. Louisville Thoroughbred owners and breeders Richard, Elaine, and Bert Klein alongside Bill Casner with WinStar Farm provided the initial grant to get the, what was then called, the Klein Family Learning Center and WinStar Library started. The old racing offices were renovated and in 2008 they were able to expand their spaces. Currently, Churchill Downs kindly provides the building and its maintenance at no cost to the program. The center later became known as the Backside Learning Center in 2010. The three values of the BLC are education, connection, and community. Those values are well represented in their programs. They provide many resources including educational programs for adults, an after school program, art and music, and bike workshops. Their educational programs include English language classes and conversation partners. 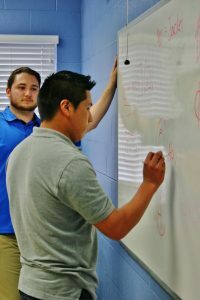 The center also provides individual tutoring where equine workers can go to get tutoring on English language development (reading, writing, and speaking), technology, GED preparation, and citizenship test preparation. The art and music programs not only teach new skills but it also aid in community building. The bike workshops teach bike repair and maintenance since bicycles are the backside workers main mode of transportation. The BLC has a bike repair station with spare parts and tools that can be accessed at any time. Sherry Stanley, the Executive Director of the BLC said, “the funding we receive from TCA goes toward our English program for backside employees. We have developed a new curriculum this year that incorporates workplace terminology into each lesson. The BLC plays an important role in the lives of workers and their families as we provide educational programming, social services, and serve as a support system to the entire population of track workers and families based at Churchill Downs”. The center is always looking for volunteers as the programs are completely volunteer run. In-kind donations for classroom supplies can also be found on their “wish list” on their website. The center serves around a thousand workers at the Churchill Downs racetrack and they pride themselves on being a “home away from home” for the backside workers who are far away from friends and family. Their annual fundraiser, “Benefit for the Backside: A Day at the Races”, held in early November, is their most significant fundraiser where people can enjoy the races at Churchill Downs and bid on unique auction items.